Our customized roasts are our number one request. Our clients have found nothing more memorable and entertaining than a carefully chosen character performing a uniquely designed presentation. We can roast one or many individuals, a whole department or even an entire company. Our shows are written and designed around material that you provide. We supply a profile form that requests information ranging from nicknames and pet peeves to fantasies and personal heroes. Our company profile requires buzzwords, system snags, new products and so forth. 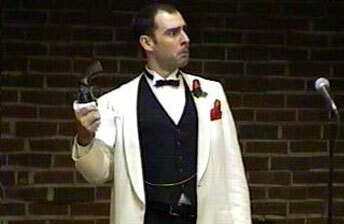 Jim Bina has been performing comedic roasts for corporate and social events for over 20 years. His impeccable timing combined with information about the roastee (provided by the client) makes for an unforgettable performance sure to make the honoree feel as special as possible. 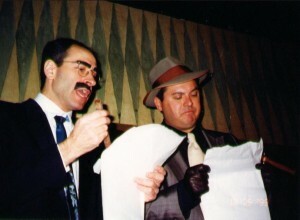 While performing the custom-written roasts, Jim can appear as any character such as a gangster,a nerd or a nosey new neighbor. Once the character and the premise are established, Jim creates a customized, interactive performance guaranteed to bring the house down. Although we feel that Jim is king in this field, we do have many performers, male and female, who have years and years of roasting experience and are absolutely hilarious! “…You were the highlight of our company dinner dance! Thank you so much for the terrific job you did in roasting our employees! Your performance was the perfect touch to a great evening.” Deborah D. Borsum, The Meetinghouse Companies, Inc.